Sam Chambliss had always been fascinated with nature and the environment, but unlike most people he made both his life’s mission — from fighting as a lawyer to protect Connecticut’s open spaces to acquiring a huge ranch in Zimbabwe to protect rhinos, elephants and other wildlife. Samuel Mauldin Chambliss was born in New Jersey in 1929, graduated from Bucknell University, and earned his doctor of law degree at the University of Pennsylvania. He went on to earn his master’s in military law from the Judge Advocate General School at the University of Virginia. He then served in Germany as a captain in the JAG Corps of the U.S. Army. For a while, he practiced with the family firm in Chattanooga, Tenn., co-founded by his grandfather. He later moved to Connecticut where he continued his legal practice in Westport before settling in Ridgefield, becoming a specialist in the emerging field of environmental law. Two of his major clients were in the town of Redding, where he served as attorney to the Conservation Commission and the Redding Land Trust. His reputation was such that, at the request of the Connecticut Department of Environmental Protection, he wrote the first draft of the Connecticut’s Inland Wetlands Act, which to this day governs land uses in wetlands. He and his wife, Janet Bavier Parris, visited Zimbabwe in 1983, and fell in love with the countryside. In 1985 they bought 18,500 acres of African savanna and moved there permanently in 1987 when the the government asked them to be custodians of that country’s endangered black rhino. The Chamblisses and two neighboring landowners enclosed their property with an electric fence, creating a 60,000-acre preserve. However, “right now, one of the big things is to save the rhino, and Zimbabwe is just about the last country where there is a significant rhino population,” Chambliss said. The rhinos the Chamblisses were trying to protect weren’t the friendliest of creatures. Soon after they set up their reserve, the government trucked in a black rhino that, threatened in another part of the country, had been captured and put in a crate for transfer. “It came out of the crate and it had enough of being cooped up. It was looking for something to damage,” Chambliss said. “Someone had left a pickup truck with two dogs in it parked nearby. After the first time he hit it, the truck bounced up and down on its shocks, which convinced the rhino it was alive. “He kept jabbing his horn between the truck and the front tire. Finally he hit the tire, which gave up the ghost with a loud sssss. “He kept right on killing the truck, till finally his horn came out through the top of the hood. After the rhino was through with the pickup and several treed bystanders, the animal turned on the 18-wheeler that had brought him. Janet Chambliss led the elephant raising, feeding them milk in pans. “They are very dependent and they bond to you,” she said. “When we first got them, after about a week, i went in and sat down cross-legged with them in an area we had set aside for them to sleep. One baby elephant lay down and put his head in my lap. 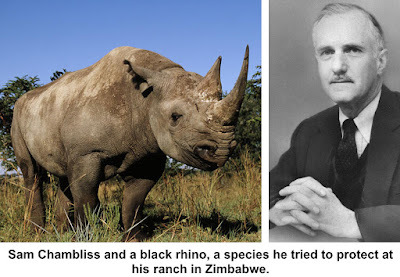 Their African paradise came to an end in 2003 when the government of Zimbabwe, which had begun confiscating property owned by white people three years earlier, finally took over the Chambliss ranch. After many tribulations, Sam and Janet Chambliss fled the country and, almost penniless, eventually settled in Gonubie, South Africa, in 2005. In 2012, with Mr. Chambliss ailing, the couple returned to the United States so he could undergo medical treatment. He died in Florida in 2014 at the age of 84.